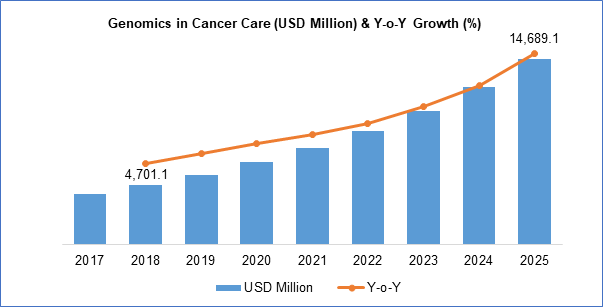 The global genomics in cancer care market size was valued at USD 4,701.1 million in 2018 and is anticipated to grow at a CAGR of 17.7% between 2019 and 2025. Genomics in cancer care can be defined as the promising technique for accurate diagnosis of cancer by focusing on advancing personalized medicine. This technology has helped in making systematic assessments for effecting and cost-effective treatment of cancer in the coming years. The field of cancer genomics is a relatively new research area that takes advantage of recent technological advances to study the human genome, meaning our full set of DNAs. By sequencing the DNA and RNA of cancer cells and comparing the sequences to normal tissue such as blood, scientists identify genetic differences that may cause cancer. The global genomics in cancer care industry is majorly driven by the in increasing number of patients suffering for cancer, and continuous technological advancements for innovating new types of technologies. Moreover, need for cost effective technology and accurate diagnosis of cancer would propel the genomic in cancer care market during the forecast period. In addition, increased adoption of these technologies in the research labs & institutes, and technological innovations for overcoming certain drawbacks of will augment the growth of the particular market during the forecast period. Genome sequencing is observing a remarkable growth owing to increasing usage of genomics and technological advancement with modern device and services. As a conclusion, growing demand for effective output with low cost treatment is augmenting the genomic penetration rate in this market. PCR and microarrays are also perceiving swift development in genomics owing to introduction of advanced devices as such devices are used to accomplish genomics procedure and are highly essential component in the target ailment market. Additionally, microarrays are used to measure an analyte present in the body tissues and blood which is further anticipated to generate lucrative growth opportunities in the industry. Moreover, consumables such as reagents, sample preparation kits, and biomarkers are widely used in genomics procedures. Thus, increasing use of consumables are also expected to increase due to vital applications in target disease management. The global genomics in cancer care market is segmented into product type, application, technology, and end use. On the basis of product type, the global market is sub segmented into consumables, instruments, and services. Instruments segment to hold the major market share owning to the increasing technological developments & advancements that support the growth digitalization in various PCR instruments for analyzing genome sequencing. While, consumable in the genomics market is observed to be the fastest growing segment during the forecast period. Based on technology, the market is sub segmented into genome sequencing, PCR, microarray nucleic acid extraction and purification. Genomic sequencing to hold the major share in the market, owing to the accurate diagnosis and cost-effective treatment that gives an effective result. Similarly, this technique helps in discovering novel drugs, such as single nucleotide variants (SNVs), structural variants, and copy number changes. Furthermore, increasing use of this technology for the diagnosis of cancer, rising number of pertaining to technological advancements. It is also observed to be a flexible, cost-effective, and flexible driving the market of genomic sequencing segments market during the forecast period. On the basis of application, the global genomics market is sub segmented into diagnostics, personalized medicines, drug delivery, and research. Diagnostics segment is observed to grow at a faster rate owning to the rising need for cancer diagnosis at an early stage, and rising awareness for genomics in cancer care. On the other hand, increasing research and development for developing novel drugs according to individual’s immunity would fuel the growth of personalized medicine segment during the forecast period. In terms of geography, North America dominates the entire market for genomics in cancer care. The growth in North America is primarily driven by the increasing number of patients suffering from cancer, increasing government & biopharmaceutical company funding for developing new drugs, and presence of key players in this region. The North America genomics in cancer care industry is estimated to share approximately 38.4% market share in terms of revenue. On the other hand, Asia Pacific is considered to grow at a faster rate owning to the developing healthcare infrastructures by the countries such as India, and China. 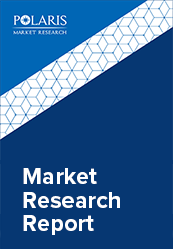 Additionally, improved healthcare infrastructure, continuous government support, and untapped market opportunities have further generated significant market opportunities to the APAC market. Huge variety in the genetic deviations have been found in single type of cancer according to a complete study of cancer genomes and thus, discovery of uncommon genetic modifications is a challenge in the field of genomics. Moreover, another major challenge is to gain a best-quality biological sample that is essential for genomic training as well as studies, primarily for tumors that are rare and treated by surgical procedures. The major players operating in this industry include Agilent Technologies, Roche Diagnostics, Beckman Coulter, Illumina, Inc., Affymetrix, Cancer Genetic Inc., Bio-Rad Labs, Pacific Bio-science, Sigma Aldrich Corporation, GE Healthcare, Quest Diagnostics, Abbott Laboratories, PerkinElmer, and Luminex. These leading players are introducing innovative products in the market to cater to the growing demand for consumers. Global players are entering new markets in developing regions to expand their customer base, strengthen market presence, and increase their market share in the market industry.